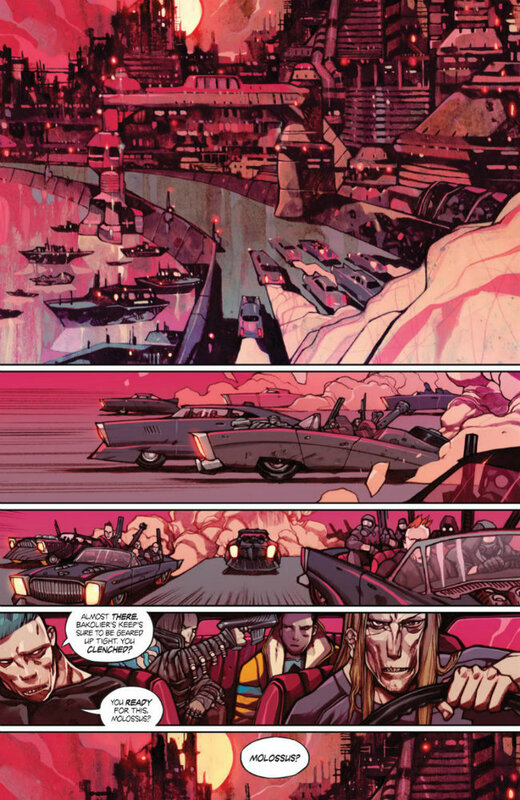 Otherworldy, action-packed, and almost painfully vivid, Steve Orlando and Jakub Rebelka’s Namesake is one of the can’t-miss series of the past year. 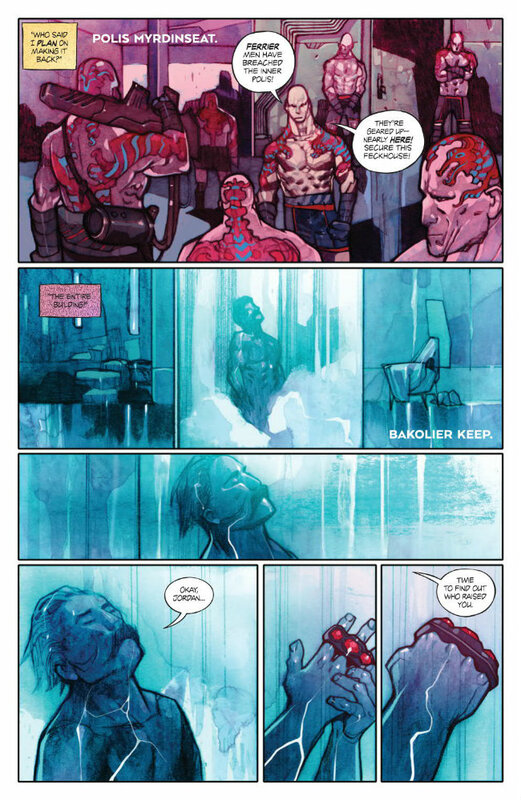 Next week, the fourth and final issue of Steve Orlando and Jakub Rebelka’s creator-owned BOOM! Studios series Namesake hits shelves, signalling two major developments in each creator’s career. 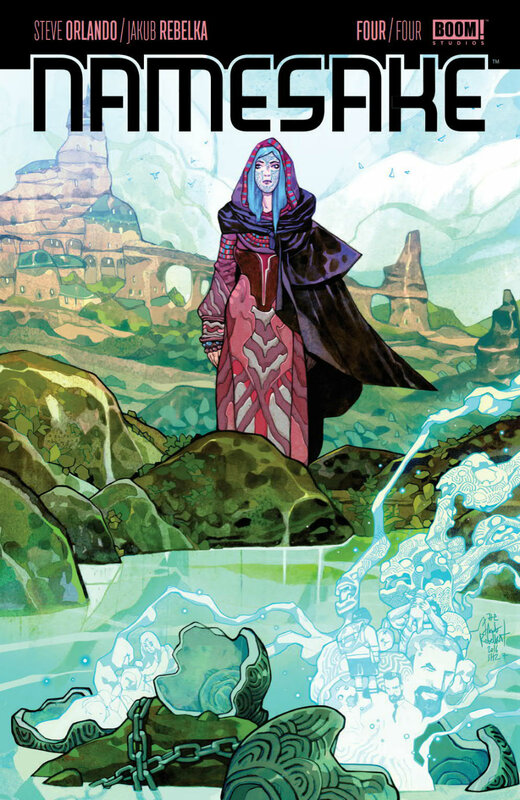 For Orlando, it represents the last project published by a company other than DC/Vertigo, for the next little while. It won’t likely be his last creator-owned book, but his new exclusive contract with DC might put a serious crimp in his creator-owned output in the short term. For Rebelka, Namesake signifies the arrival of a major new talent on the scene. Although not a complete stranger to comics, Namesake is by far Rebelka’s highest profile gig yet, bringing his distinctive artwork to a wider North American audience. A bittersweet, ultra-violent thriller that welds together elements of cutting edge sci-fi with contemporary urban fantasy, Namesake is ultimately an action-packed family drama that plays across two worlds. 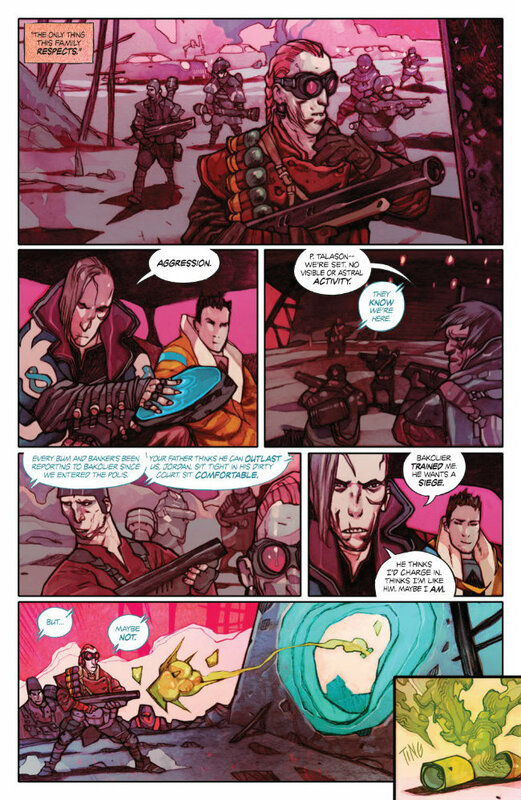 Just as protagonist Jordan Molossus throws caution to the wind to confront (and possibly kill) his estranged father in another world, so too shall we leap into the fray to bring you our three reasons why you need to read Namesake. Okay, so we’re not leaping anywhere. Just read the damn series anyways! Trust us, you don’t want to miss out on this out-of-this-world title. No, the hit ‘80s NBC sitcom starring Michael J. Fox has nothing to do with the series – that would be strange even for the world of Ektae (though probably not inconceivable given the place’s otherworldly nature). Rather, we’re talking about a thematic element interwoven into the series, driving Jordan’s quest to reconcile himself to his tangled dual heritage. This is a theme that seems to run throughout Orlando’s work, visible even in his recent hit DC series Midnighter and Apollo, as the two protagonists struggle to build a life together, while fighting bad guys. In Namesake, this theme is even more pronounced, as we follow Jordan’s journey to Ektae to confront one of his two fathers, who also happens to be the most powerful criminal on two worlds. Desperate to prove he is nothing like the vicious, cold-hearted Bakolier, Jordan nonetheless discovers he may share more in common with his brutal old man than his kinder, gentler human father. However, rather than allow the realisation consume him, Jordan resists killing Bakolier, proving he’s his own man – as human as he is Ektae. 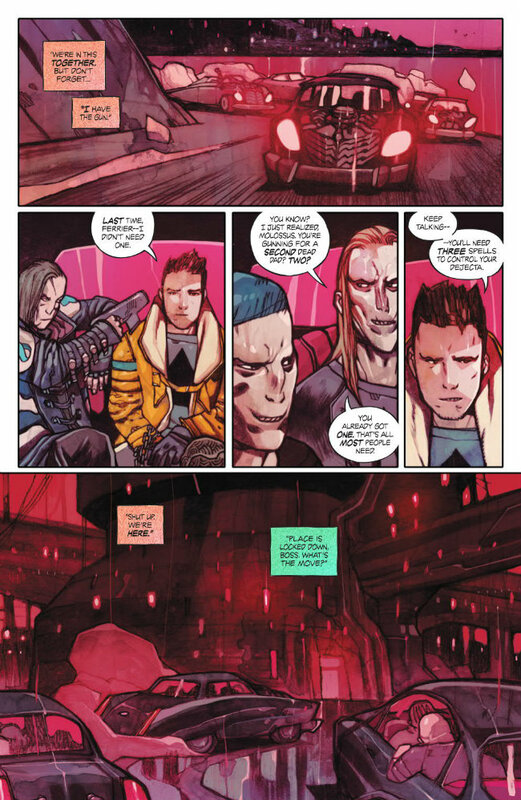 We won’t go so far as to say that without Jakub Rebelka Namesake wouldn’t be possible, because we’re sure Steve Orlando would have found a way to get the series published without him. We just can’t imagine another artist, who could bring the world of Namesake to life with the same unique flair as the Polish artist. Rebelka’s singular style brings an exotic, almost alien visual tone to the twin realms of Earth and Ektae. 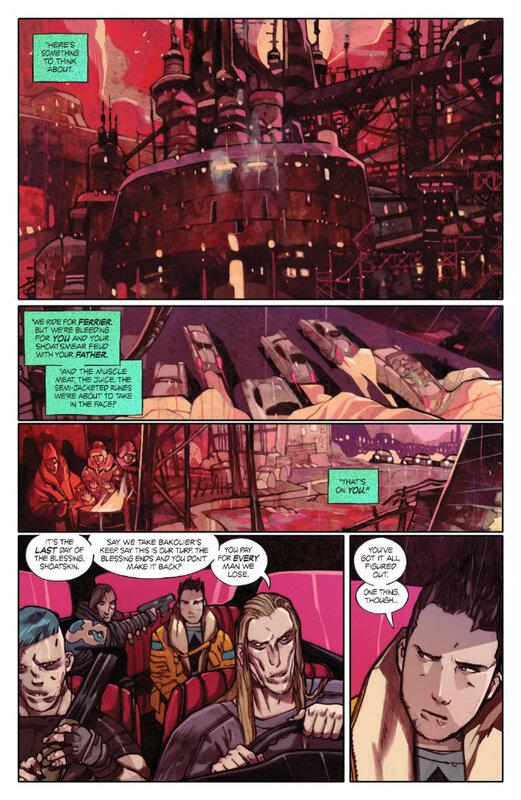 From the opening sequence at the start of the Blessing – when the two worlds align for seven days – to the climactic battle in the final issue, Rebelka’s robust rendering and lurid palette choices bring to life a fictional universe unique in comics. His cityscapes and backgrounds are haunting, at the same time imbued with a kind of imminent weight, while remaining transitory and ephemeral. You can feel the mass of two worlds bearing down on each other, even as they fuse together for a few short days. The creative synergy enjoyed by Orlando and Rebelka is dynamic and rich; evident in every panel of the series but its Rebelka’s remarkable artistic vision that rewards the reader with a textured, tactile reading experience. Jordan Molossus’ flight from Earth to Ektae to once and for all escape his fathers’ hold over him is one fraught with long-held secrets and mortal danger. Having put himself in Bakolier’s crosshairs during the last Blessing, Jordan doesn’t plan on making it back home to his lover Sid. He realises his quest is impetuous and fueled by a deep, abiding anger over being abandoned, a suicide mission he’s not likely to survive. Orlando ratchets the action up with each passing issue, injecting Jordan’s journey with ever-increasing dangers. High-speed car chases, brutal hand-to-hand combat, and cunning escapes infuse the plot with an escalating sense of urgency that only reaches its crescendo in Jordan’s final confrontation with Bakolier. The masterful pacing drives the action ever onward but makes time for quieter, expositional sequences that manage to stay light and fluid, never bogging down the plot’s forward momentum. It’s a wonderful display of balance and craft from one of the medium’s emerging stars and shouldn’t be overlooked as one of the series’ greatest strengths. Published by BOOM! Studios, Namesake #4 comes out Wednesday, February 8, 2017.